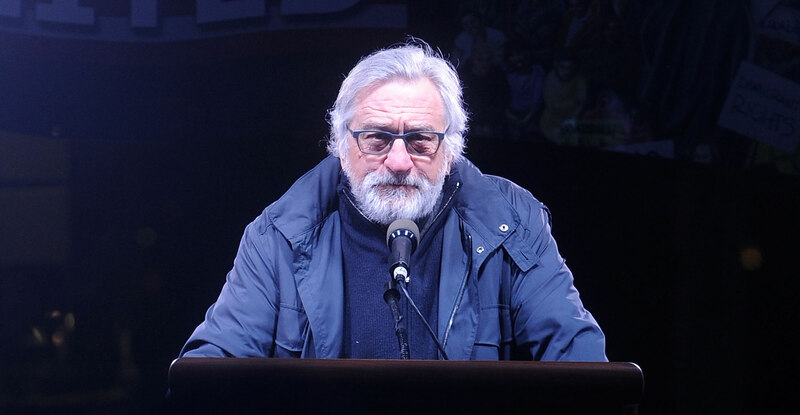 Robert De Niro attended the Film Society of Lincoln Center’s 45th annual Chaplin Award Gala in New York Monday night to honor Helen Mirren — but after a quite quick “Congratulations, Helen, on being honored with this year’s Chaplin Award,” he swiftly and quickly transitioned to ranting about politics — because, well, there’s plenty to rant about. “I’m going to digress for a minute,” he said before starting a three-minute takedown of the White House Correspondents’ Association, the Trump administration and Press Secretary Sarah Huckabee Sanders. First, De Niro went after the White House Correspondents’ Association, which released a statement saying that comedian Michelle Wolf’s monologue at the White House Correspondents’ Association dinner “was not in the spirit” of this year’s event. He continued with choice words for Sanders, who received the brunt of Wolf’s jokes at the WHCA dinner last weekend. This isn’t the first time De Niro has taken a stand and dished out harsh political criticism recently. He has said at past events that he won’t stop speaking out until things change.